Picking up discarded items from the curb can be tricky, even in a city as practiced as New York. Who wants to risk hauling a TV down three blocks and up four flights of stairs to find out it doesn’t work? Or what if that nice side table has bedbugs? Luckily, artist Sarah Nicole Phillips has a fix. Sarah Nicole Phillips' Curbside Object Status Tag. Image courtesy of the artist. Her Curbside Object Status Tags are a public service for curbside shoppers. The tags “facilitate the smooth operation of the informal sidewalk gift economy. Those who place objects on the curb for people to pick up may now indicate the condition of the object to folks by ticking the appropriate box on the tag.” Each tag is hand printed and identifies whether the object functions perfectly, is infested, or occupies a spectrum from almost-working to completely defunct. People attach the tag to their object, and trash-day foragers no longer have to fruitlessly haul televisions and toaster ovens around town. Sarah Nicole Phillips, a curbside collector herself, created the tags because of the “inefficiency” in the trash redistribution system that occurs due to a lack of information. The tags facilitate educated scavenging so objects are diverted to the most appropriate homes. Phillips recalls that, “one [tag] user reported back about a non-functioning mini fridge that was labeled as such. Whoever took the fridge away –it was gone in under an hour– knew what they getting into.” Perhaps the person wanted the fridge for parts, but we can be sure that they didn’t haul it away with the hope of putting yogurt in it right away. 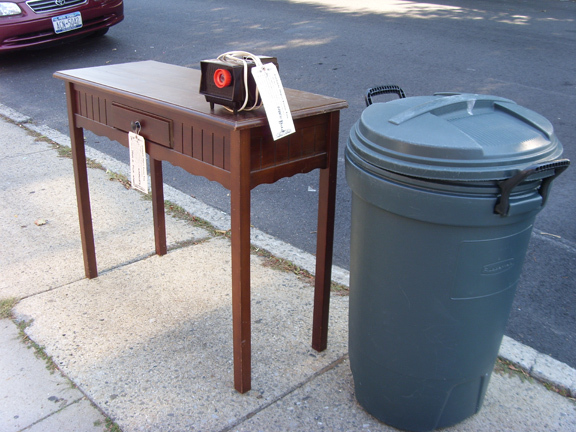 Phillips believes that the tag’s presence on a curbside object can also reduce the stigma some people feel while investigating “trash.” A little DIY-bureaucracy goes a long way. Yet the tags are more than just labels to facilitate reuse and collection. The approximately 1,000 tags Phillips has sold or given away are individually silkscreened by hand in her home studio rather than photocopied or processed industrially. The creation of a handmade, original artistic object that may be destined for the landfill is an act of stewardship and generosity regardless of whether the tagged object is picked up by a passerby or a sanitation worker. Sarah Nicole Phillips literally cares for trash and curbside culture through the creation and donation of her art. Phillips has distributed the tags in a number of ways. She’s placed notices on Craig’s List and other list-serves, handed them out to friends and fellow trash forgers, placed them in two art exhibitions where they were available for gallery visitors to take, and she sells packs on Etsy to help recoup her production costs. 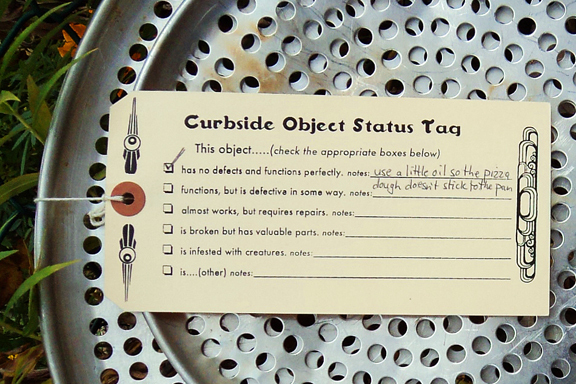 If you do manage to get yourself one of Sarah Nicole Phillip’s Curbside Object Status Tags, please send her an image of the tagged object for her website. Botha, Ted. (2004). Mongo: Adventures in Trash. New York, Bloomsbury. Rufus, Anneli and K. Lawson (2009). The Scavengers’ Manifesto. New York, Jeremy P. Tarcher/Penguin. Curbside Object Status Tags in action in Brooklyn. Image courtesy of the artist. This entry was posted in Art, Consumption, Reuse, Uncategorized, Urban, Value. Bookmark the permalink.